CBW is the call sign of the CBC Radio One station in Winnipeg, Manitoba. The station broadcasts at 990 kHz (AM). CBW is a Class A Clear-channel station reserved for Canada under the North American Regional Broadcasting Agreement allocations. CBW's studios are located on Portage Avenue in Downtown Winnipeg, while its transmitters are located near Beaudry Provincial Park in Springstein. Due to the station's transmitter power and Manitoba's mostly flat land (with near-perfect ground conductivity), it reaches almost all of southern Manitoba during the day and much of the middle portion of North America at night. In addition, the station is simulcast on a low-power FM station at 89.3 MHz (with a transmitter atop Bell MTS Place Main, also in Downtown Winnipeg). CBC Winnipeg Building, 541 Portage Ave. The station first signed on in 1923 as CKY, owned and operated by the Manitoba Telephone System. It became a partial affiliate of the Canadian Radio Broadcasting Commission in 1933, and was purchased outright by the CBC in 1948. The station adopted its current call sign a few months after the CBC purchase, and the CKY call sign was reassigned to a new commercial radio station. CBW was part of the Trans-Canada Network, which was the main CBC radio network, while CKRC carried programming from the Dominion Network between January 1, 1944 and 1962. The transmitter was originally located in Carman. On February 3, 1952, a small plane with 3 passengers struck the Carman tower, due to heavy fog. None of the passengers survived. In November 1964, CBC opened a centralized antenna, and transferred the CBW signal to Starbuck. On October 15, 1993, CBW began broadcasting from a transmitter site in Springstein, while CBW-FM's 98.3 FM signal remained at the Starbuck tower. CBW moved from the 3rd floor of the Telephone Building on Portage Avenue East to its current location at 541 Portage Ave, activating its new equipment on July 5, 1953, The opening officially occurred on September 25, 1953. Over the next week the station held open house tours of the station. The building cost $1 million to construct and was state of the art at the time. Today, CBW shares this same location with CBW-FM and CBWT-DT. 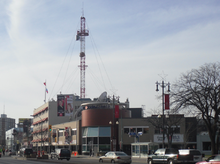 On March 16, 2006, the Canadian Radio-television and Telecommunications Commission (CRTC) approved an application by the station to implement a new FM transmitter in Winnipeg to simulcast the AM programming due to poor AM coverage in parts of the city. CBW-1-FM 89.3 operates from a transmitter atop the Richardson Building. Its effective radiated power is 2,800 watts. The main AM transmitter site is in Springstein, west of Winnipeg on Highway 424. The call sign CBW was previously used by the CBC Radio station in Windsor, Ontario in 1937-38 until it was shut down. When it was revived in 1950, the Windsor CBC outlet became CBE. CBW's local programs are Information Radio in the morning, Radio Noon and Up to Speed in the afternoon; The Weekend Morning Show runs on Saturdays and Sundays, and the arts and culture show Manitoba Scene at 5:00 p.m. on Saturdays in addition to North Country programming weekdays at 7:30 a.m. and 12 p.m. CT.
CBWK-FM Thompson and its rebroadcasters also air programming from the CBC Manitoba studio in Winnipeg (with the exception of Information Radio). Janet Stewart, host "Radio Noon"
^ "Small Plane Hits CBW Tower in Carman, Manitoba". Winnipeg Free Press. February 4, 1952. p. 1. ^ "New CBC Nerve Centre Springs to Life Sunday". Winnipeg Free Press. July 1, 1953. p. 3. ^ "Official Opening CBC Building". Winnipeg Free Press. September 24, 1953. p. 14. This page was last edited on 11 January 2019, at 22:51 (UTC).